Question. Why is the Vancouver Sun cold-calling me with a ‘promotion’ when I’m on the do not call list. Huh ? Why ? 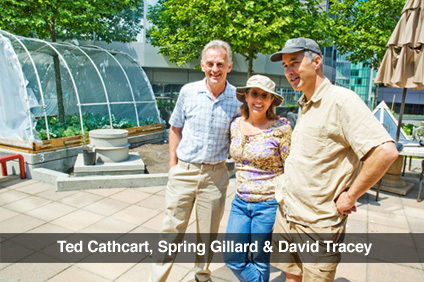 I’ve started producing a series of podcasts about Urban Agriculture, hosted by Spring Gillard and David Tracey. The series will run on Spring’s website, CompostDiaries.com, as well as on VanGoGreen. We recorded the first in the series on Tuesday at the YWCA downtown’s roof garden. It’s an interesting project, and all the food grown in the garden is taken to a women’s group on the downtown east side. You can read more about the rooftop garden / food project on the Y’s website. Ted Cathcart runs the project, and he was kind enough to spend an hour with us explaining the project and discussing the challenges. The podcast runs just over 18 minutes. podcast and photo © Bigsnit Media Consulting Inc.
Dr. Mendefro, who I did a podcast with recently for the Plan Institute, has just been appointed a White House Fellow. Details here.